A few years ago, as my obsession with wine was picking up steam, I decided that I wanted to make my own wine. Some of my friends thought I was crazy, while others thought it was really cool and wanted to help out. I spent a few months reading winemaking books and home winemaker forums online, preparing myself for the 800 lbs. of Dry Creek Syrah grapes that were destined for my garage. My first vintage was 2011, a notoriously difficult year for grape growers and winemakers in California. We had a long, cool summer, followed by rain at the end of the growing season. 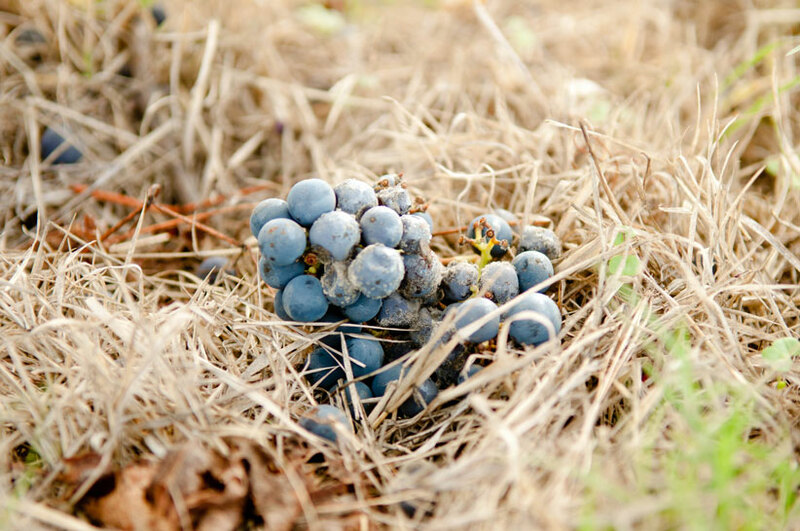 Anyone who picked their fruit before the rains were able to produce age-worthy, complex, structured, and focused wines, while those who waited until after the rain were running into issues such as the grape’s sugar content getting diluted by the rain water and mold. My grapes fell into the latter category, and we had to make a quick decision to harvest before the problems we were encountering in the vineyard progressed. We had to drop about 10% of the fruit before harvest, which had grown moldy from the moisture. The wine that I produced that year was rife with issues, and my inexperience compounded by my generally worrisome demeanor was a recipe for disaster. I cried a lot that year in the corner of my garage, not knowing what to do when I ran into various problems. I did eventually get that wine out of the barrel and into the bottle, as a last-ditch effort to see if it would come around – it smelled like the inside of a brand new garden hose from the moment it was finished with malolactic fermentation. I now have about 10 cases of home-made Syrah that smells like nail polish remover and rubber “aging” in wine storage. What I’ll end up doing with that wine is still TBD. Fast forward another year, and I decided to give winemaking another shot. 2012’s summer was shaping up to be a short and hot one, and I was able to source some Russian River Valley Zinfandel from a gentleman up in Santa Rosa for just $1/lb. 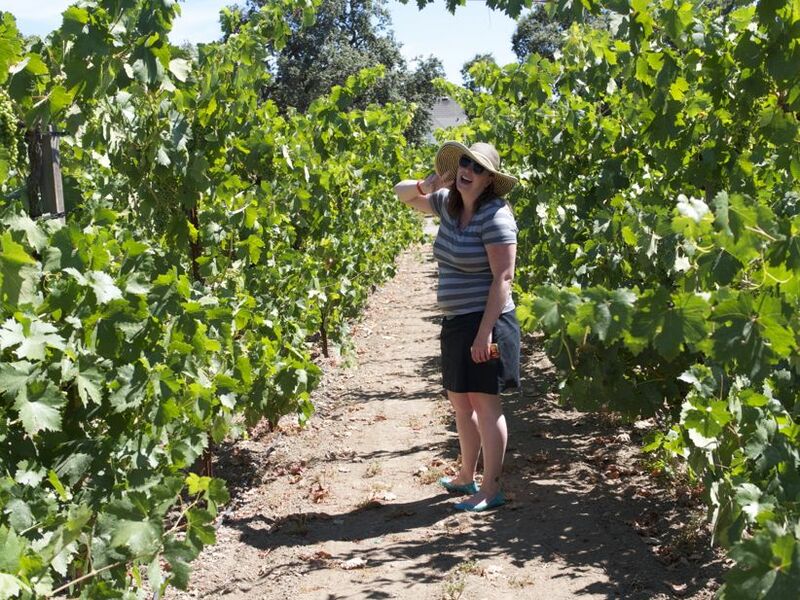 This was also the year I got married, just about a month before harvest – I actually planned my wedding to be early enough where it wouldn’t interfere with my winemaking (I’m a girl with priorities, okay?). 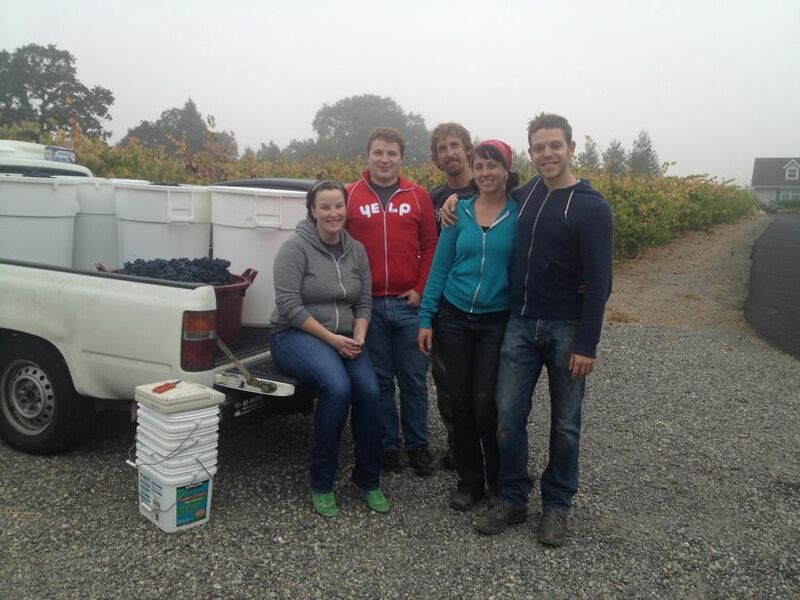 Four friends helped me pick those Zinfandel grapes at 24 degrees Brix on the foggy morning of October 6th, 2012. My 2012 Zinfandel was a joy to make. I had all of the equipment I needed, better understood what to expect, and had my routine down a little bit better. I actually enjoyed the winemaking process, and didn’t shed a single tear the entire time! I had two 44-gallon fermenters bubbling away, along with a couple of carboys full of saignée that would make a lovely, early-drinking rosé. 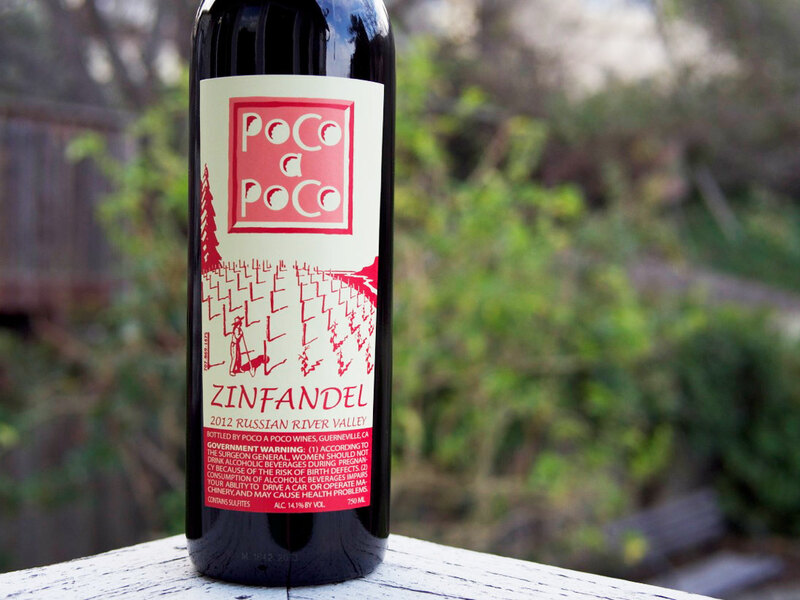 My Zinfandel spent about 13 months in a neutral French oak barrel, and I was unsure how good it would be once bottled. I bottled it in May, and since then the wine has really come around. It’s absolutely delicious – floral, rich, balanced, fruity without being jammy, and spicy, with elegant structure for a Zinfandel. I still have a few carboys I need to bottle, which I swear I’ll get around to soon! I am planning to make only rosé from that same vineyard this year, which means I’ll be picking my grapes a little earlier than I did in 2012. I just paid a visit to the vineyard a few weekends ago, to see how the fruit was coming along. 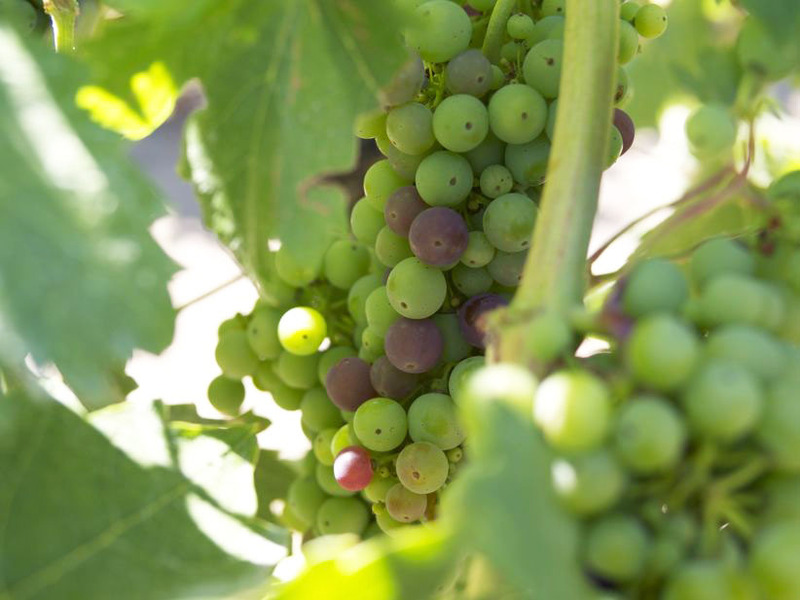 They had just started verasion, and the farmer is planning to thin the fruit this week. 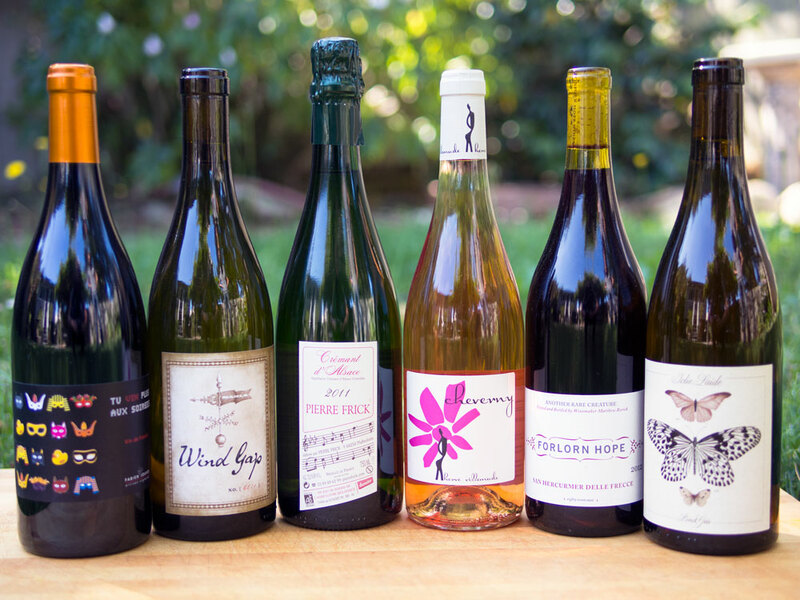 Winepress.us – an online home winemaking forum, moderated by small commercial producers and home winemaking veterans. MoreWinemaking.com – a website selling affordable home winemaking gear. Most importantly, make sure you have plenty of friends who will be supportive of your endeavor and eager to consume your finished product. Summer is just around the corner, but the recent warm temperatures may have you thinking it’s been here for a while! The wines on my table have all been light-bodied and served with a chill, and most of them are the perfect pairing for a weeknight barbecue. Here’s a round-up of our five favorite wines for summertime, all available on Winelandia.com! Nothing yells SUMMER like rosé wine. 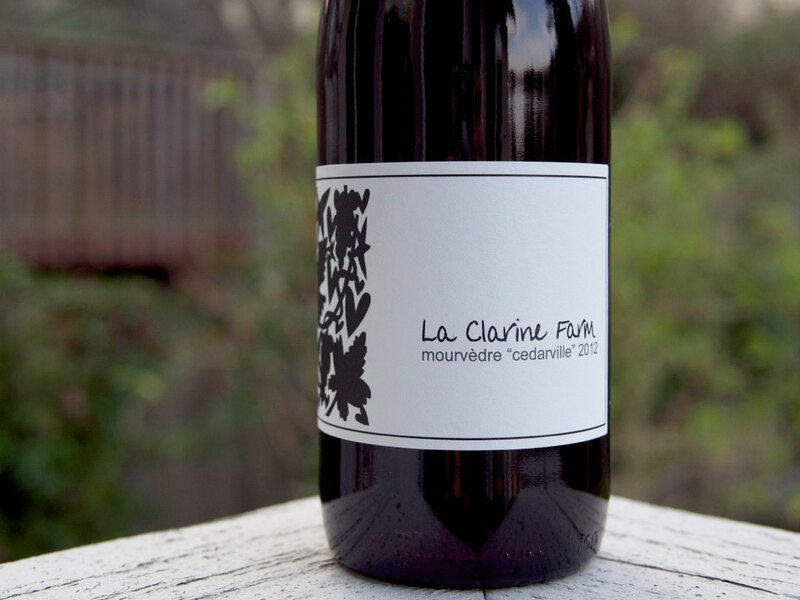 We opened a bottle of this delicious vino from La Clarine Farm last night to enjoy with our hot links, grilled Tartine bread, and arugula salad. 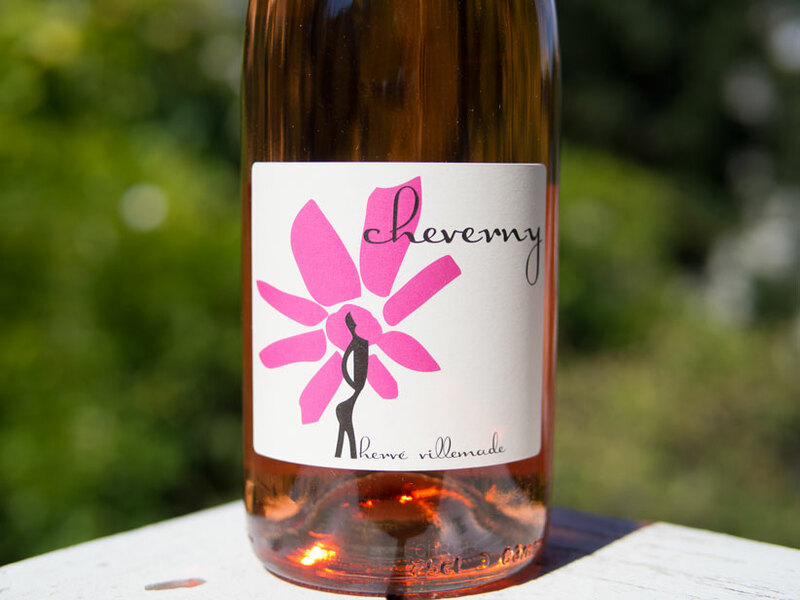 It is surprisingly expressive, with intense aromas of grapefruit blossoms and herbs. It’s luscious and textured while still having a zippy acidity to make it thirst-quenching on a warm summer evening, and it’s an absolute steal at this price. 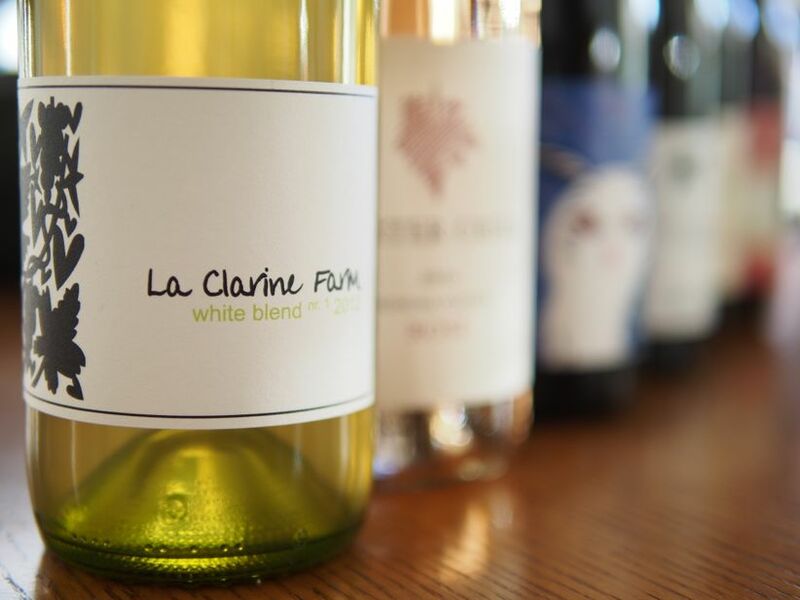 All of the La Clarine Farm wines are made in extremely limited quantities, so get some before it’s gone! The joyful wines of Spanish natural wine producer Rafa Bernabé are a new discovery for us, and we just can’t get enough of them. This juicy Grenache is from the Alicante region in Spain (just off the south-eastern coast), which faces the Mediterranean ocean. ‘El Morron’ is fresh and vibrant, sees no new oak, and has no added sulfites. A really beautiful Spanish wine, perfect for a warm evening. 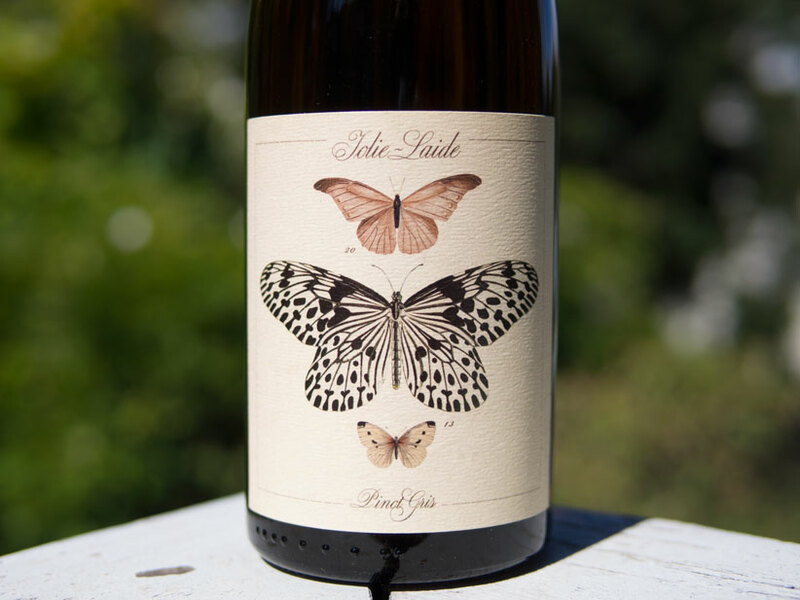 Jolie-Laide is one of our favorite California producers, and these wines cause quite a ruckus when they are released each year. We were lucky enough to get our hands on some of this rare and delicious juice that has earned itself a cult following. 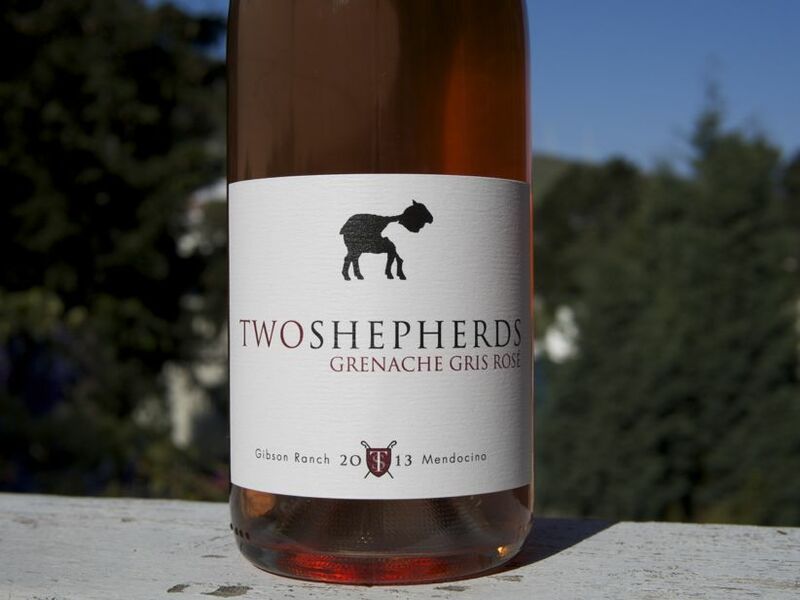 The 2013 Trousseau Gris is not quite a white wine and not quite a rosé – it’s a peachy-colored white wine with incredible aromatics and texture. Enjoy this delicious and unique wine with citrus and cilantro-stuffed whole grilled snapper. Riesling is a wine often overlooked by casual wine drinkers, but it’s the summertime darling of fanatical wine lovers. It’s fresh, luscious, aromatic, zippy, and great with spicy foods. 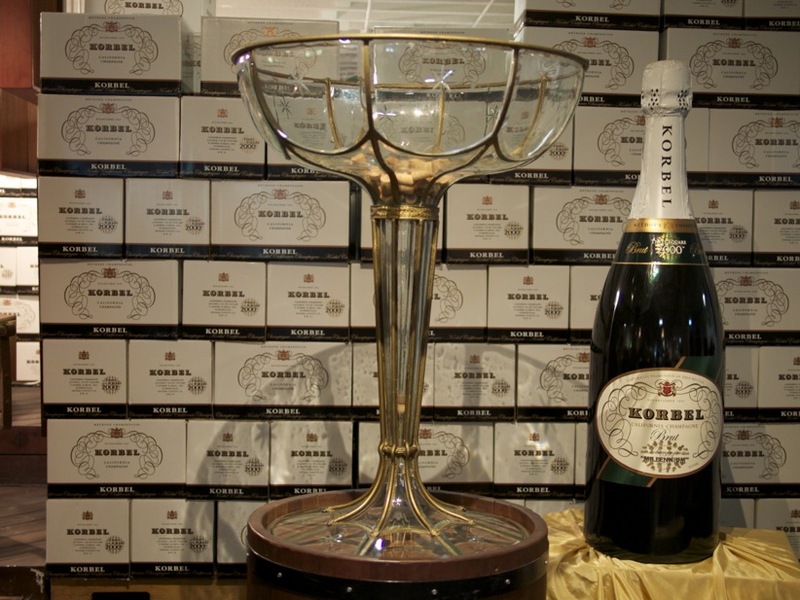 This particular wine from German producer Knebel is perfectly balanced and priced to be enjoyed any day of the week. It’s dry (but not too dry) with mouth-watering acidity, which will make it great with food or all by itself. An excellent wine for a pool party! Steve Matthiasson makes the best Napa Valley Chardonnay we’ve ever had at a price point that’s hard to beat. 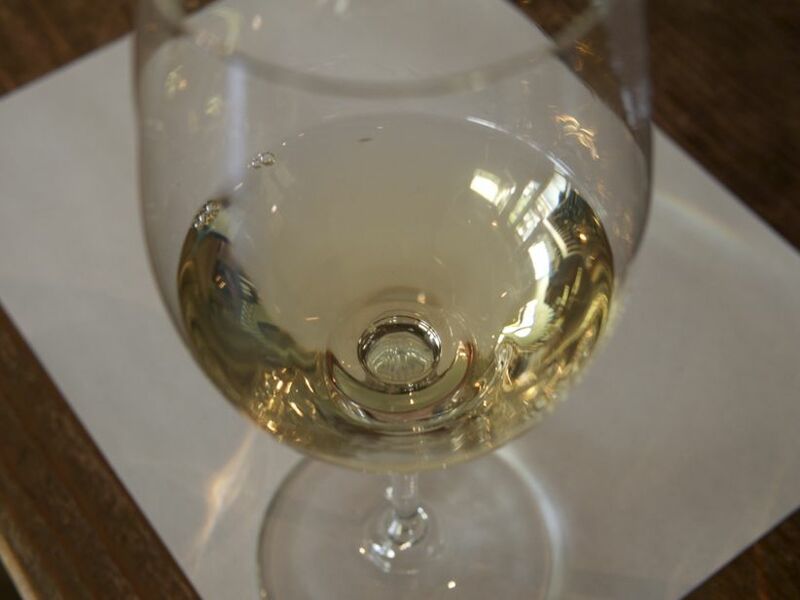 This is not your Aunt Mary’s buttery, oaky chardonnay – it’s quite the opposite. 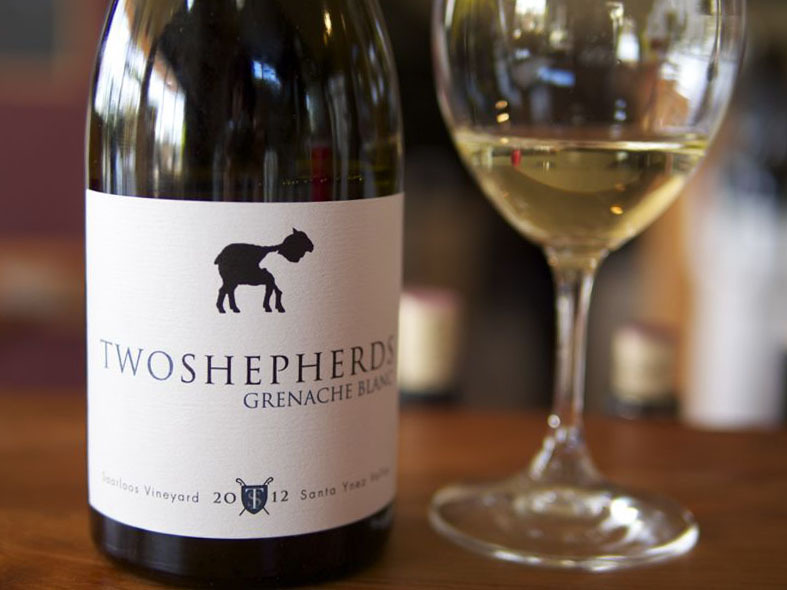 This beautiful example of California Chardonnay has notes of citrus, apples, and honey, with balanced acidity. 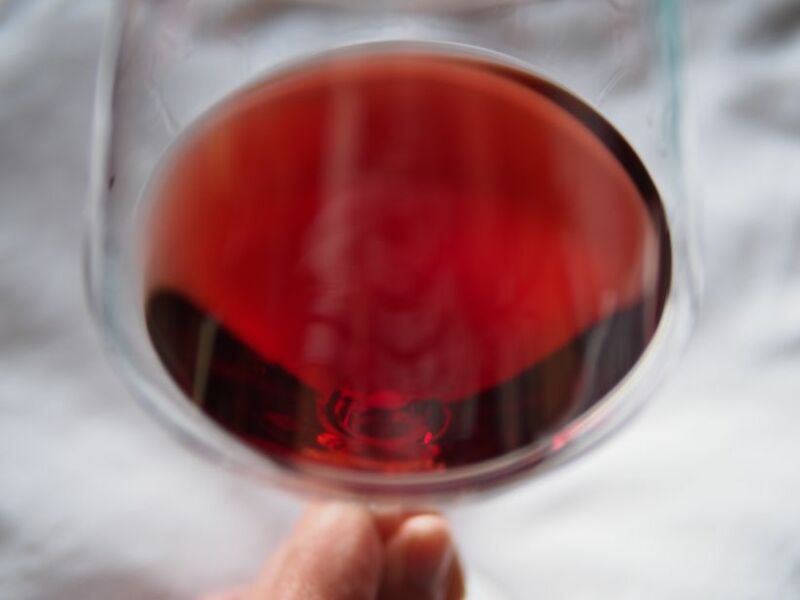 The wine was aged in neutral oak and allowed to undergo partial malolactic fermentation, so it has a touch of texture while still being fresh and juicy. Enjoy with friends on a grassy knoll, preferably under a blue sky full of puffy white clouds. 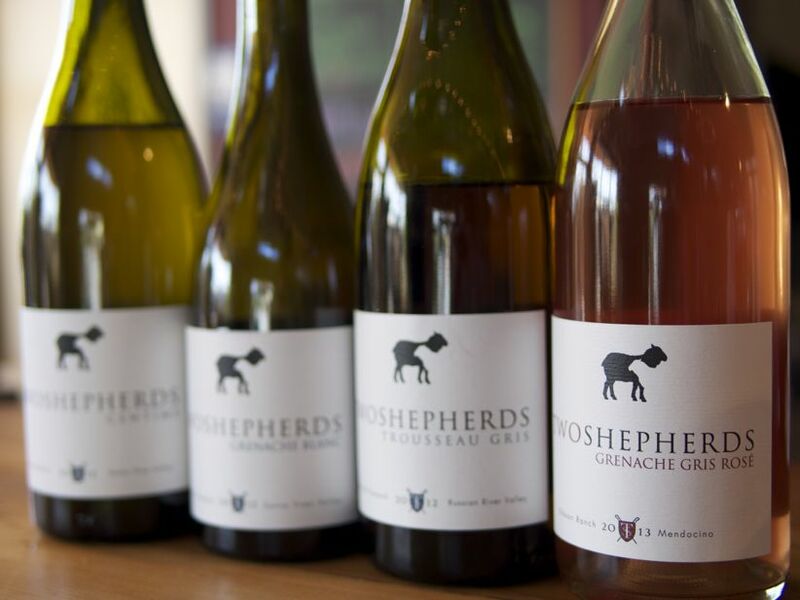 Interested in purchasing some of our delicious summertime wines? Check out our delivery terms and order yours today! It’s been pretty warm around these parts, so instead of offering heavy winter wines we are focusing more on wines with energy and verve. Evocative of the impending spring, these wines are fresh and rich. A Chenin Blanc from the Loire that tastes like pure bottled sunlight; a Müller-Thurgau from extreme elevations in northern Italy; a rustic and juicy old vine Zinfandel from a cool-climate Biodynamic vineyard in the Russian River Valley; a dry Brachetto that smells like a bouquet of roses; a funky & geeky red blend from a French-born producer in Chile; and a feminine & seductive Mourvèdre from the decomposed granite soils of the Sierra foothills. Bio: Setting out to make wine representative of its appellation, Frantz Saumon purchased a small plot of land in Montlouis in 2002. Since then, he has acquired more land and most of the 6 hectares are planted with old growth Chenin Blanc, which is all farmed organically and by hand. 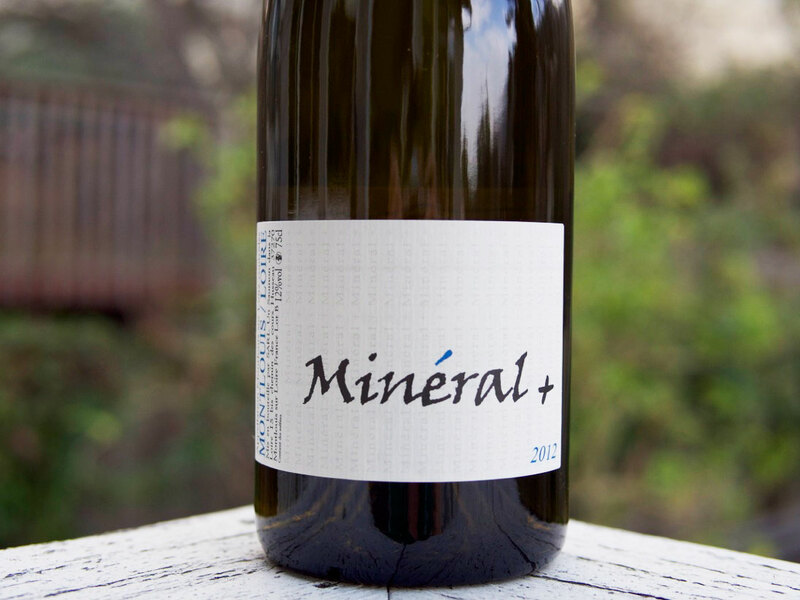 Production Notes: Minéral + is made with grapes from all of Saumon’s Chenin Blanc plots in Montlouis. 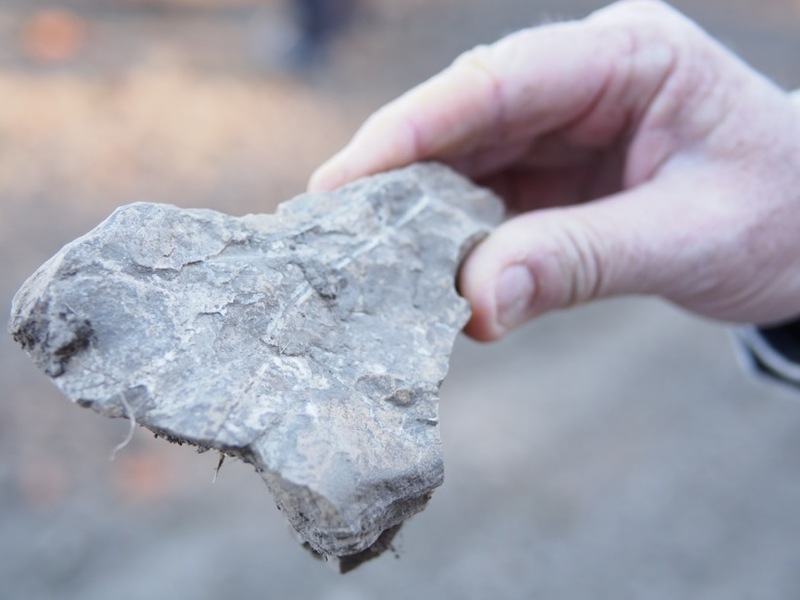 Mineral soils help produce a wine that is full of distinctive Montlouis minerality. The vines average age is 40 years and they are planted in a blend of soils composed of tuffeau (limestone) and silex (flint). 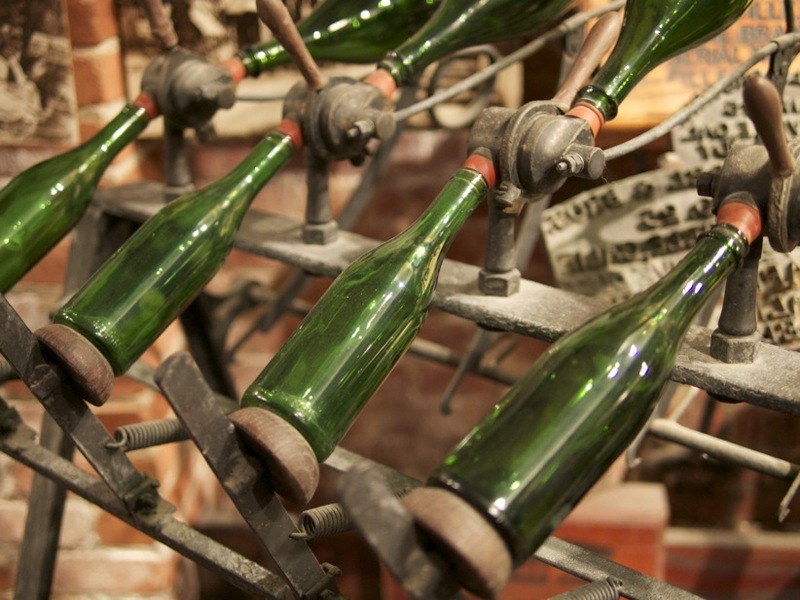 Every vintage yields a wine with a little bit of residual sugar, but the wines taste dry. The sugar lends a textural element to the wine which helps balance it. 100% indigenous yeast fermentations and aged in Stainless Steel tanks. Tasting Notes: Stonefruit, citrus and mineral, medium bodied, elegant, and rich with a backbone and texture that will compliment a wide variety of foods. Bio: Radoar is located near the border of Austria in Northern Italy. Norbert Blasbichler took over in 1997 and is the 15th generation to farm this land, which has been in the family since the 1300’s. Radoar is, first and foremost, an organic apple farm. They grow Golden Delicious apples, and create distillates such as brandy from the fruit. In addition to growing apples, chestnuts, peaches, pears, and walnuts, Radoar grows several types of grapes from which they produce wine and Grappa. Vineyard: Certified organic. 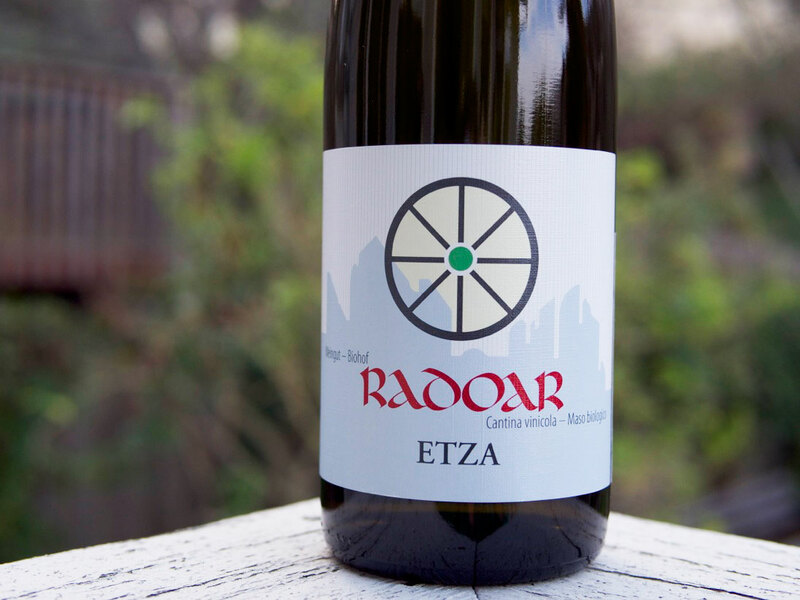 3000’ in elevation, the estate vineyards of Radoar are 1.5km from the farm. Production Notes: Müller-Thurgau is a cross between Riesling and Madeleline Royal, developed in the 19th century. Organically farmed, direct-to-press, and fermented with indigenous yeasts in stainless steel. Tasting Notes: Aromas of citrus and white flowers followed by ripe peach on the palate with juicy acidity and a lingering finish. This is a great wine to serve with hard-to-pair vegetables such as asparagus and Italian cheeses. 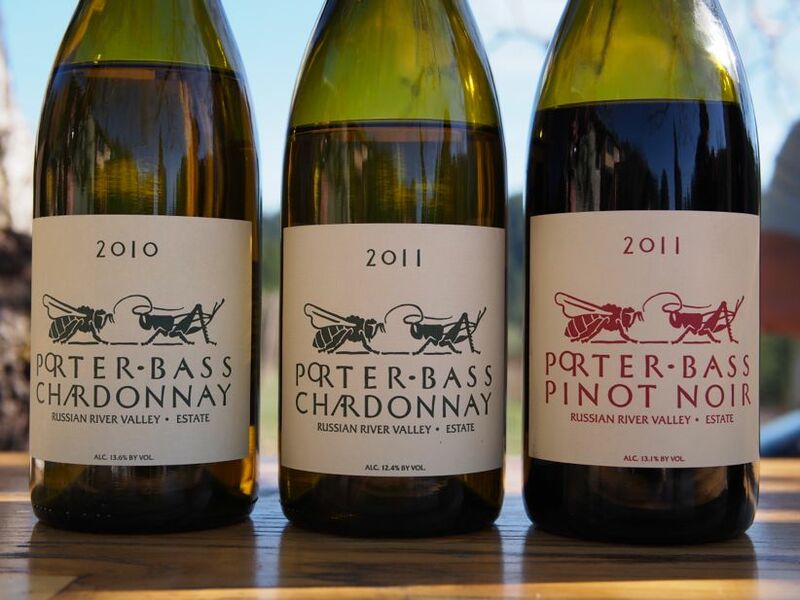 Bio: Luke Bass’s family has owned Porter Bass Vineyards since 1980, when the family discovered the century-old vineyard. The land had been subjected to decades of farming-induced erosion, so they slowly brought it back to life through Biodynamic and organic farming. Luke grew up on this property, and was a winemaker before he even had his first paying job. 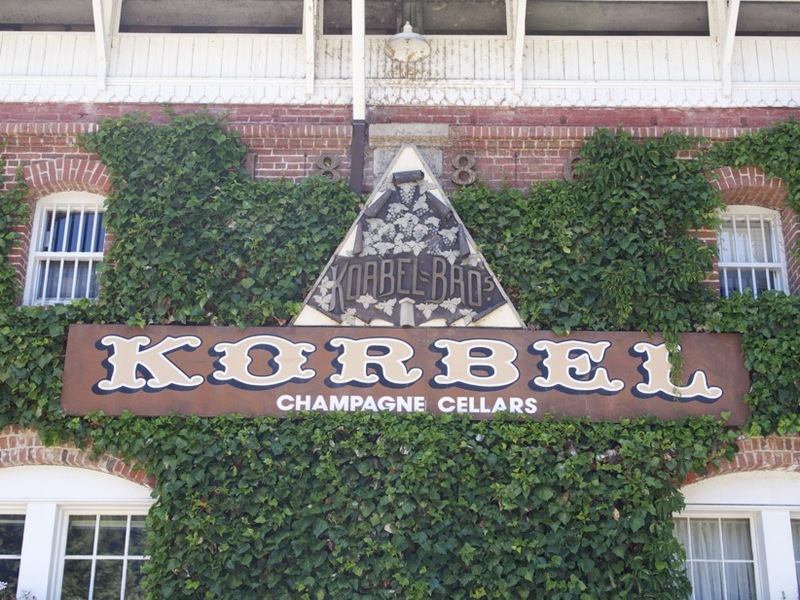 Previously, he interned at Flowers winery, which evolved into a position as cellar master. He has also worked at Hirsch & Tandem in Sonoma, as well as Flagstone in South Africa and Casa Marin in Chile. 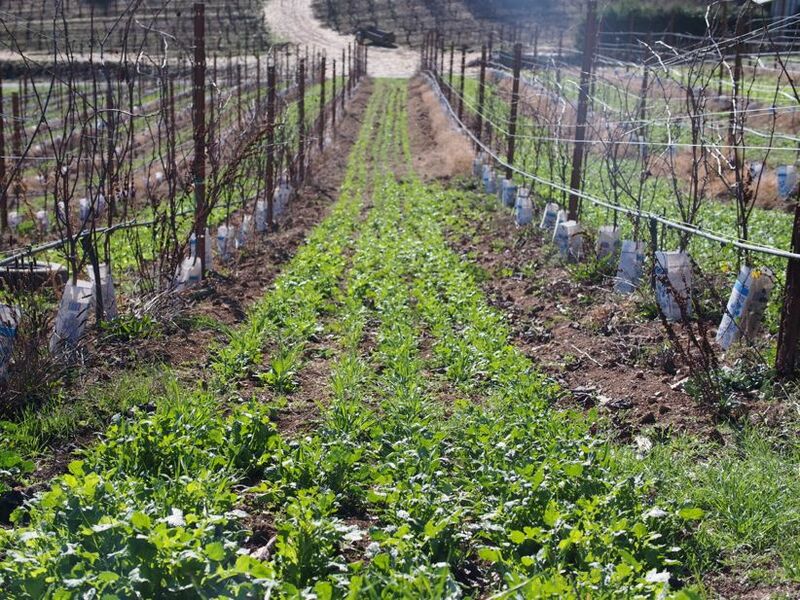 Vineyard: Demeter Certified (Biodynamic). 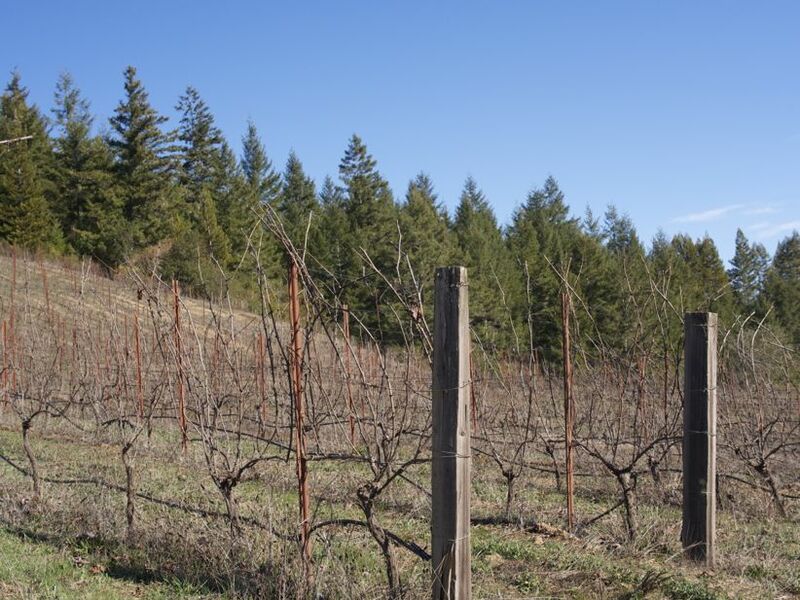 The vineyards are protected from winds by the surrounding Redwood and Fir trees, while the fog produced by the nearby Russian River helps cool the vineyard in the summer. 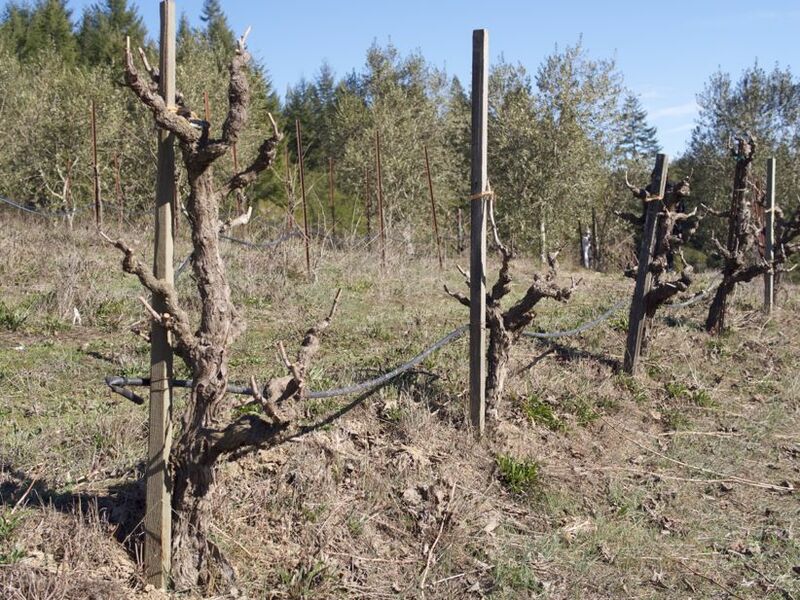 Production Notes: Old vine Zinfandel. Native yeast fermentation and spontaneous malolactic fermentation. Very little sulphur dioxide (SO2) added. Tasting Notes: Blackberry, dark cherry, wild bramble, spice. Medium-to-full bodied with zippy acidity. Food Pairings: Fried chicken, sweet BBQ, burgers, pasta with rustic sauce, pizza, root vegetables. Bio: Matteo Correggia died in a tragic tractor accident in 2001. 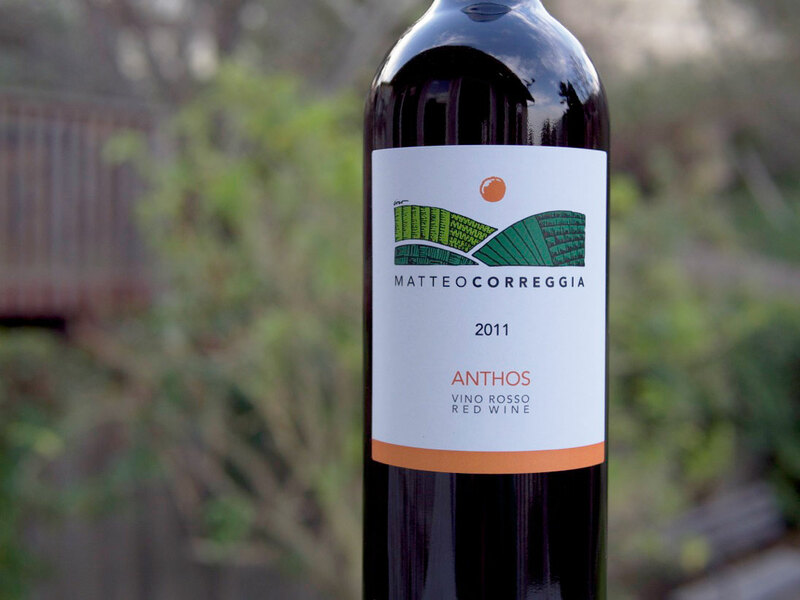 His wife, Ornella Correggia took over winery operations and hired Luca Rostagno as the winemaker. Ornella has continued to grow the winery’s reputation as the benchmark producer in Roero, and has introduced organic & biodynamic farming and winemaking practices. Vineyard: Organic. Sand, silt, & clay soils at 900’ elevation. East/South-east facing slope. Production Notes: Brachetto is a native Piemonte varietal normally used to produce sweet, sparkling wines. This version is totally dry and exceptionally elegant. Estate fruit, organically farmed. Fermented with controlled temperatures in stainless steel. Minimal skin contact during indigenous yeast fermentation. Manually harvested in mid-September. 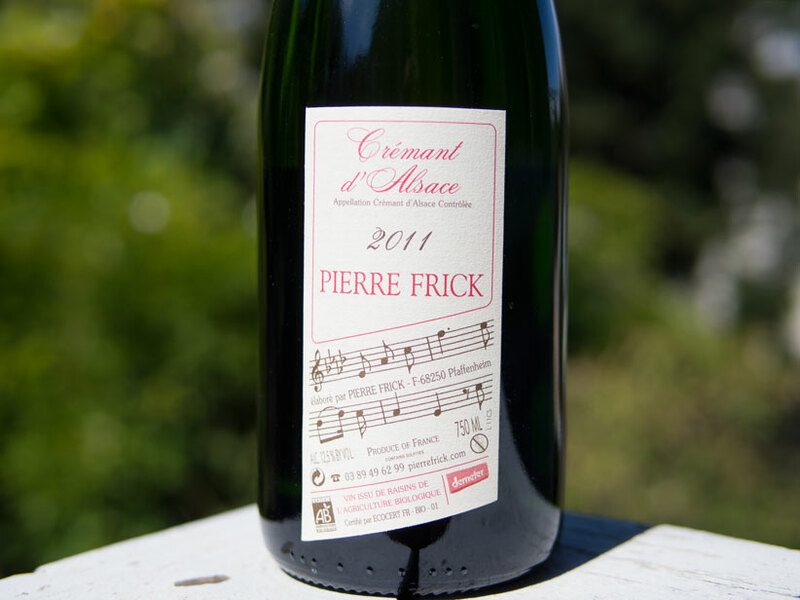 Tasting Notes: Aromas of fresh roses dominate, with notes of herbs, strawberries, and cherries. Light-to-medium bodied, with delicate texture and balanced acidity. Serve slightly chilled on a warm California winter day and enjoy on the patio by itself or with Italian-style snacks. Bio: At the age of 22, Luyt set out for Chile under the guise of wanting to brush up on his Spanish. Luyt learned that Chilean wines were homogenous, and wondered if great wines could be made there. He went back to France and began to study viticulture & oenology in Beaune. During his studies, he befriended Mathieu Lapierre, and eventually worked with the Lapierre family at their winery in Morgon for 5 vintages. 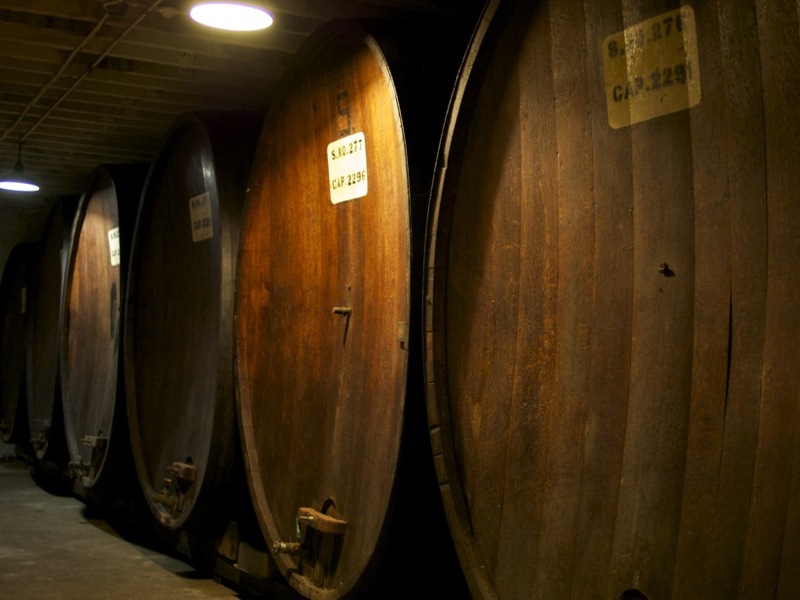 There, he learned about natural winemaking, a skill he became determined to bring back to Chile. Clos Ouvert was founded in 2006 by Luyt and two partners, who backed out of the project in 2010 after a massive earthquake resulted in the loss of 70% of their 2009 wines. Luyt pressed on and expanded, which now involves many different types of grapes and parcels. Production Notes: País and Carignan are carbonically macerated. The Cinsault and Cabernet Sauvignon are destemmed and vinified in a Burgundian style. 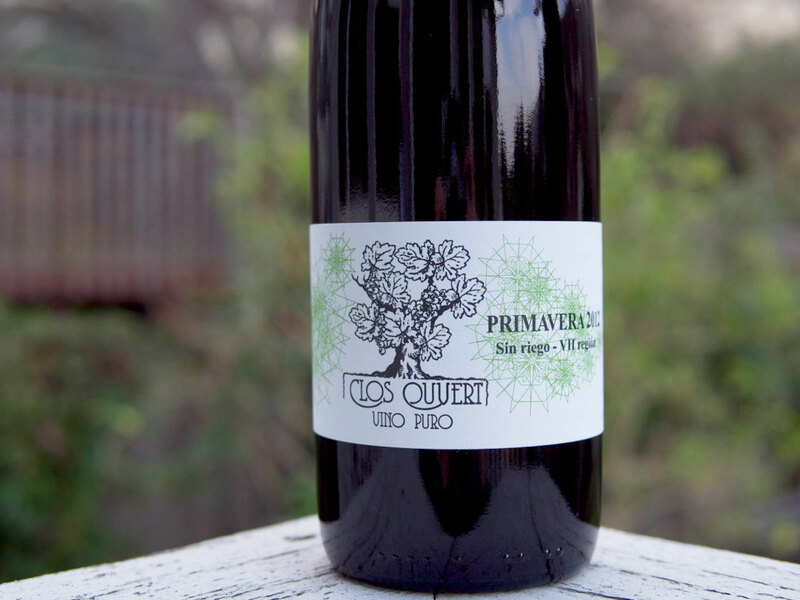 The finished wines are blended to produce Primavera. Tasting Notes: Full bodied, structured, lively, and full of mineral. Smoky elements give way to ripe fruit, herbs, and black pepper. 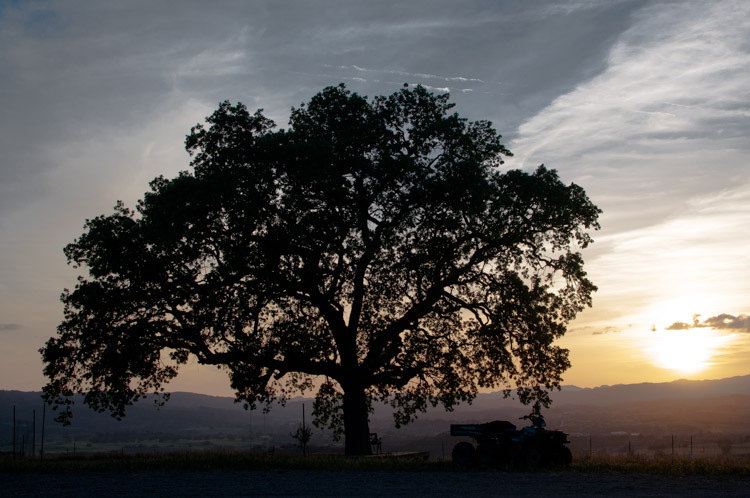 Bio: Run by Hank Beckmeyer, La Clarine Farm is a principled stand out in California winemaking. A follower of Masanobu Fukuoka’s “Do Nothing Farming” methods, Beckmeyer has created a holistic vineyard and winery experience, trying to leave the grapes alone to, in a sense, make the wine themselves. Beckmeyer has been quietly making wines in the Sierras since 2001, and has a diverse lineup, comprised largely of Rhone wines, both white and red. Vineyard: Cedarville. Organically farmed. Soils comprised of decomposed granite. Production Notes: This wine was made during an ideal vintage in California – lots of sun during the summer and no rain. Hank Beckmeyer decided to try something new this time around, and set out to make the wine more sensual by employing a new ‘recipe’. He shortened the length of time the wine spent on the skins, pressing early and letting the wine finish fermentation in the tank or barrel. The result is a brighter and more supple wine than the previous vintage. Tasting Notes: High-toned tropical fruit and crushed red berries on the nose, with tart cranberry and mineral on the palate. It’s no secret that I’m obsessed with wines from the Jura. White, red, yellow, sparkling, rosé – I love them all. 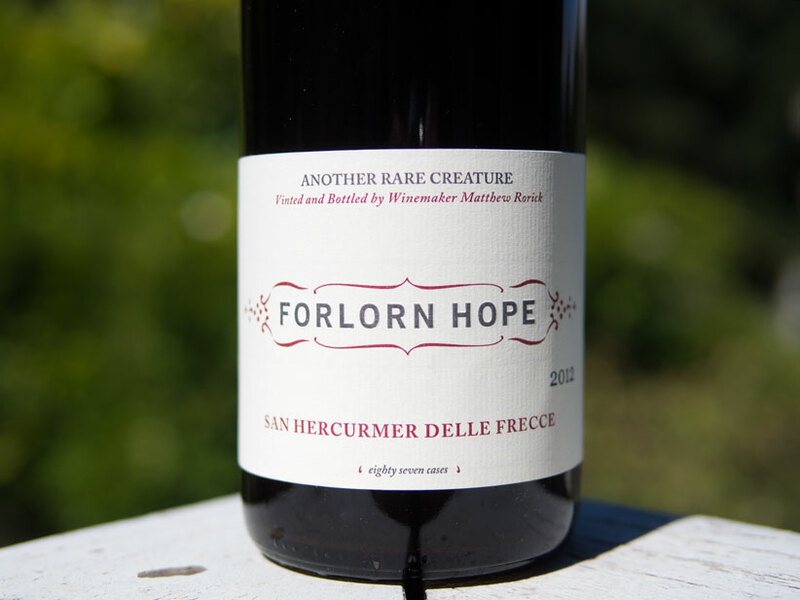 The red wines are particularly delicious to me, so you might imagine how excited I was to find that Copain – a local producer based in the Russian River Valley – was growing and making wine from the Trousseau grape. 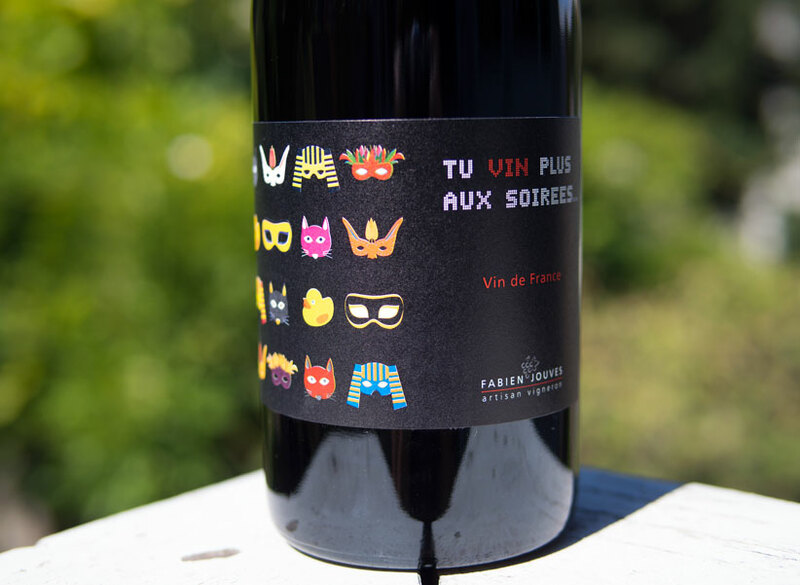 There are only a handful of Californian producers that I know of making wine from Trousseau – one being the renowned Arnot-Roberts – which they have made since 2009. It turns out, the Copain plantings of Trousseau are grafted from the original vines used to produce the Arnot-Roberts Trousseau. Colleen happened to be the person to introduce me to this great wine from Copain. We enjoyed a bottle of it over dinner at her house one fateful night. I was taken aback by it’s freshness, finesse, texture, and the outright Jura-ness of it. A California red wine epiphany. It was like drinking red Jura without the reductive aromas often found in Jura reds. I was in love with this bizarre little bottle from our home turf. I eventually found this wine again at Ruby Wine in Potrero Hill, and snapped up a bottle before it was all gone. Revisiting this wine really cemented how I initially felt about it, and it was showing even better the second time around. It was floral, spicy, and fruity all at once. It’s not often you can find a wine from California with so much elegance, complexity and femininity. It was full of texture while still being light on it’s feet. I was crushed when I found out that the Trousseau was all sold out for the year – I’d hoped to score some of it for the Winelandia Wine Club. I guess I can wait until next year. 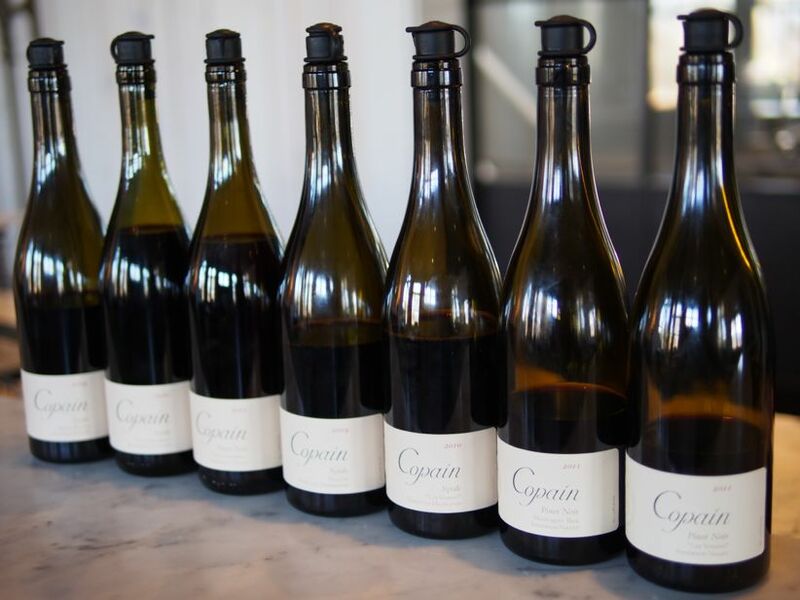 The Copain Trousseau is what inspired a trip to the Copain winery in the Russian River Valley – just off Eastside road in Healdsburg. I headed up there just this past weekend to taste through their current offerings and to see the estate. You have to make an appointment to visit, so be sure to call before stopping by. 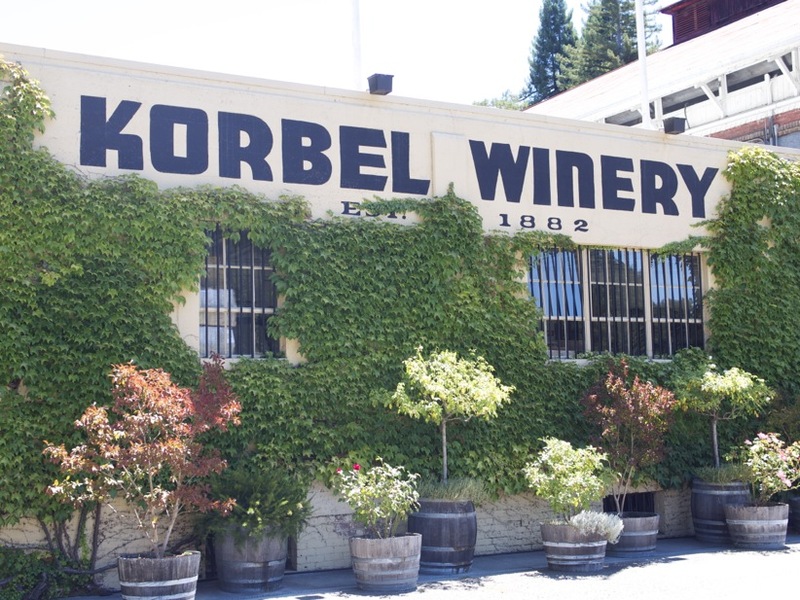 It’s conveniently located just off Highway 101 in Healdsburg. Upon arriving, I was immediately enamored by the beauty of their estate. Small and rustic, it overlooks Riverfront Regional Park, a gorgeous little oasis complete with a redwood grove and multi-use trails for bikes, equestrians and hikers. The park would be a great place to enjoy a picnic at if you are visiting the winery, as the picnic area at the winery is reserved for wine club members only. They have 13 acres planted here – all of which is Picpoul Blanc, Trousseau and Poulsard. Everything is farmed sustainably, encompassing both organic and Biodynamic practices (although they are not certified for either). I took a seat at one of the comfy wooden chairs out front, and Phil graciously began my Farm Table tasting beneath the strangely warm January sun. Phil poured for me all of their current offerings, beginning with their estate Picpoul Blanc. This neat little wine is aged in neutral French oak, which gave it body and character not normally found in your typical Picpoul Blanc porch-pounder. It was a great entrance to the wines that would follow, which included their entry-level “Tous Ensemble” Chardonnay, followed by several Pinot Noirs and Syrahs. The Pinot Noirs, mostly from the Anderson Valley area, showed rich and flavorful typicity of the region. The Syrahs – from the Yorkville Highlands – were dark, savory, and brooding. All of their red wines (the Syrahs in particular) showed tons of aging potential with great structure and balanced acidity. 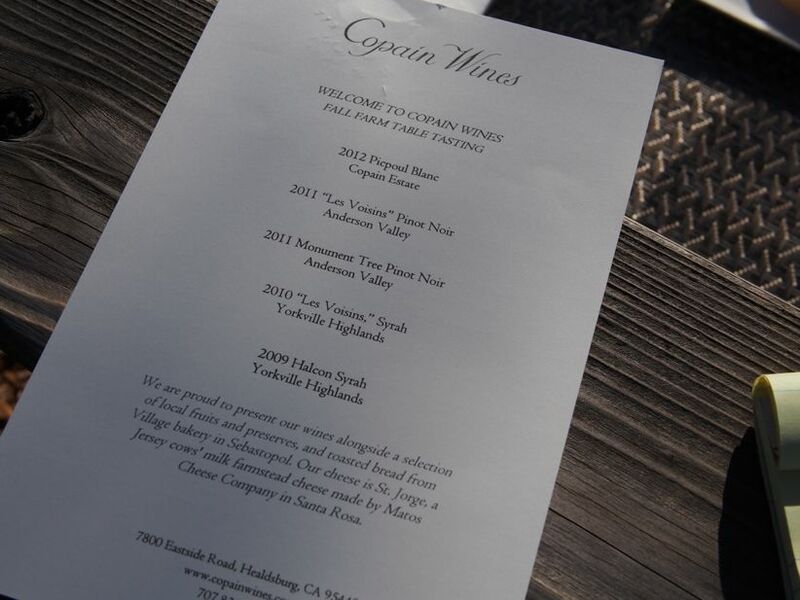 Copain wines are definitely Californian in style, but with restraint and balance normally reserved for the Old World. The Farm Table tasting also included a delicious spread of local cheeses, meats, and snacks. I especially enjoyed the crostini with white bean purée and fried rosemary. 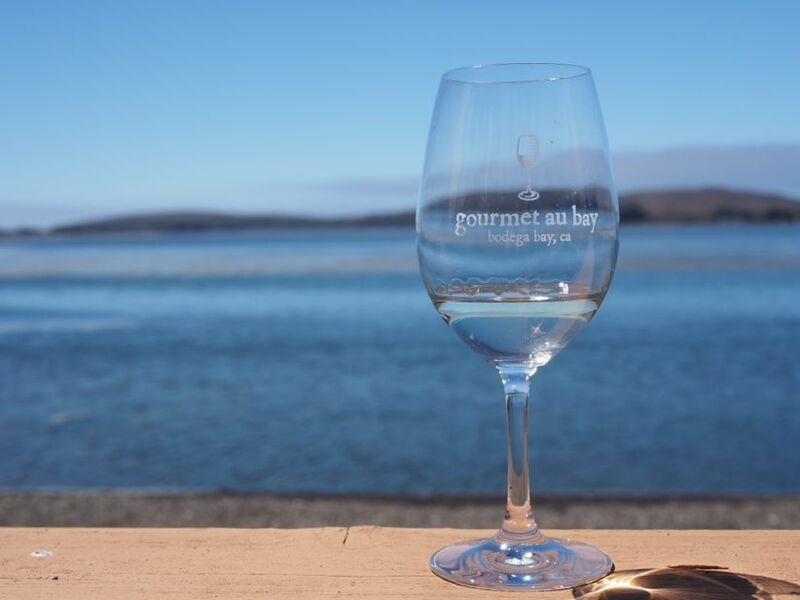 Everything paired beautifully with the wines that were served, the abundant sunshine, and the relaxing view. 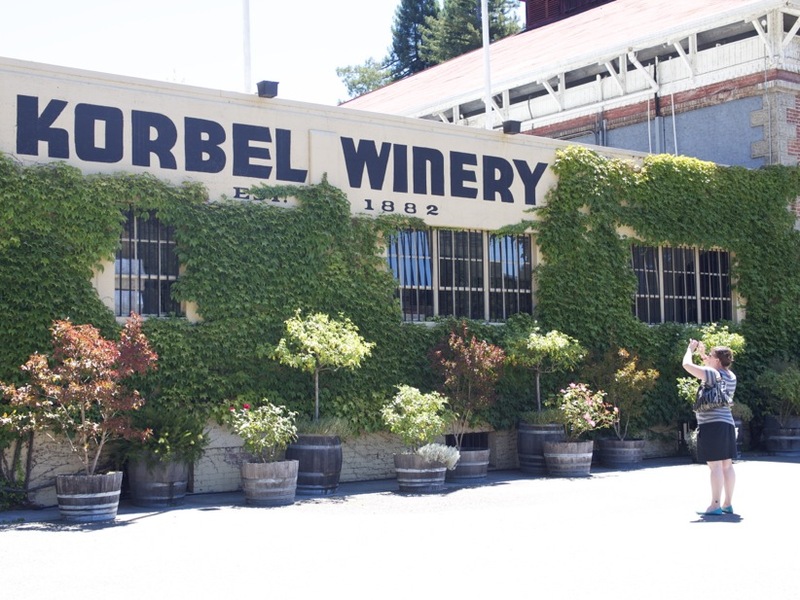 It doesn’t get much better than this – it’s the Holy Grail of the wine country experience. I appreciate the warm hospitality shown to me by my host, Phil, and the beautiful wines made by Wells Guthrie. Winelandia hopes to offer wines from Copain in the future, as we feel they are one of the better producers in California. 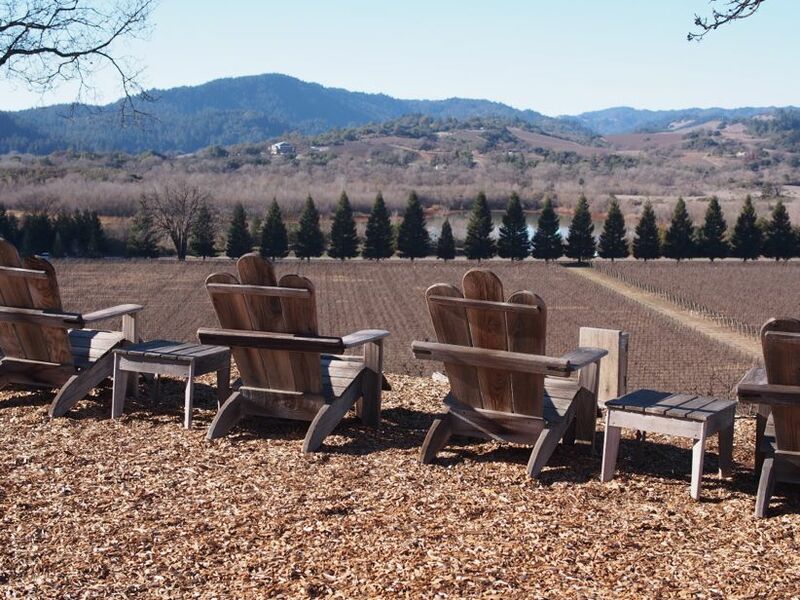 We highly recommend you stop by Copain for a visit if you’re planning a trip to the Russian River Valley – you won’t be disappointed. They are just an hour and a half north of San Francisco. Be sure to call ahead to schedule, as they are appointment only. 2013 was a bit of a renaissance year for wine in California. With American writer and columnist Jon Bonné championing the producers of “New California”, many local wine-makers are producing restraint, elegance, and a sense of terroir in their wines. There has been an influx of new blood, with young guns exploring both experimental and old-world winemaking techniques. Finally, we are able to shop in a wine store and buy a bottle of California wine that doesn’t reek of oak, stewed fruit, or buttered popcorn. Instead we can find mineral, forest sap, chapparal, white flowers and stonefruits. The year has also been particularly kind to me. Having left my technology career in June to launch Winelandia, 2013 has been a year of soul-searching, experimentation, sometimes failing miserably, 14 hour work days, and exploring things way outside of my comfort zone. Trying to find my place in the wine industry has been trying at times, defeating at it’s worst, and absolutely transcendental at it’s best. That being said, I would much rather ride the wine rollercoaster than the tech dump-truck any day. In 2013, I have most certainly tasted more wines than ever before. Colleen and I take every opportunity we can to go to industry tastings and visit small wineries, unearthing every stone we find in hopes of discovering something new to share with you. The most beautiful thing about wine is the sense of discovery and the sheer joy felt when you take a whiff and a sip of a wine that moves you. That’s what we want to share with you, that feeling of pure love. Wine is love. 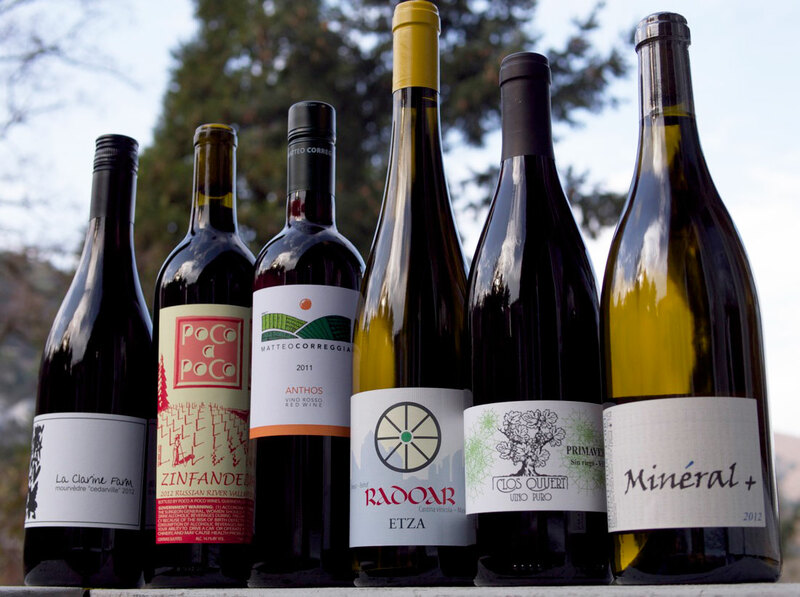 Below is a list we have compiled of some of our favorite California producers of 2013, in no particular order. Some of them you may recall from your wine club shipments, seen in local wine shops, or read about in articles in the Chronicle. Next time you buy some wine, look for these producers, because we feel they are making some of the best wines today in California. Style: Scott only makes a handful of wines (so far), but they unusual, thought-provoking, and unique. 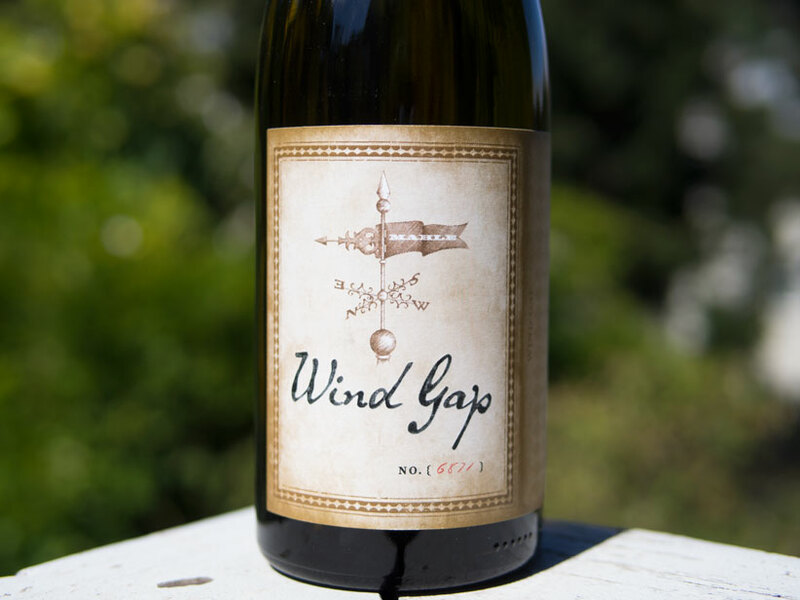 We have seen a Russian River Trousseau Gris with texture and unmatched complexity, an elegant Syrah from Phoenix Ranch in the cooler part of Napa, and a super-clean summertime quaffer of a Pinot Gris from the famed Windsor Oaks Vineyard on Chalk Hill. The labels for his wine change every year, are as mysterious and beautiful as his wines. He is definitely a winemaker to watch; his wines are quickly gaining cult status amongst wine geeks and are insane quality for the price. Style: Ryan & Megan (a young married couple) make some really delicious, affordable, interesting wines. The style is both experimental and old-world, much like Jolie-Laide (and wouldn’t you know it, they share a winemaking facility). 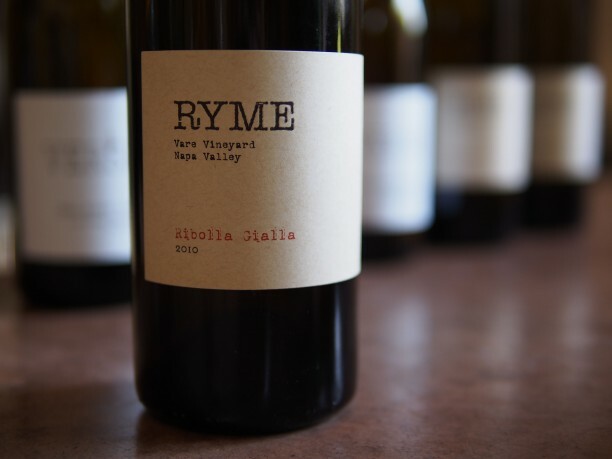 Some of our favorite wines made by Ryme are their Carneros Pinot Noir – a fresh and juicy wine reminiscent of cru Beaujolais, and their skin-fermented “His” Vermentino – a textural and savory skin-fermented white wine. All of their wines are super clean and beautifully balanced. We can’t wait to see what they have to offer next. Style: A Demeter-certified (Biodynamic) estate, Philip and Mary Hart planted their vines in 2004. They make wines in a super-natural way, mostly of Rhone varietals. It can get quite hot in Paso Robles, but the location of their estate is directly in path of the cooling coastal winds coming through the Templeton gap. 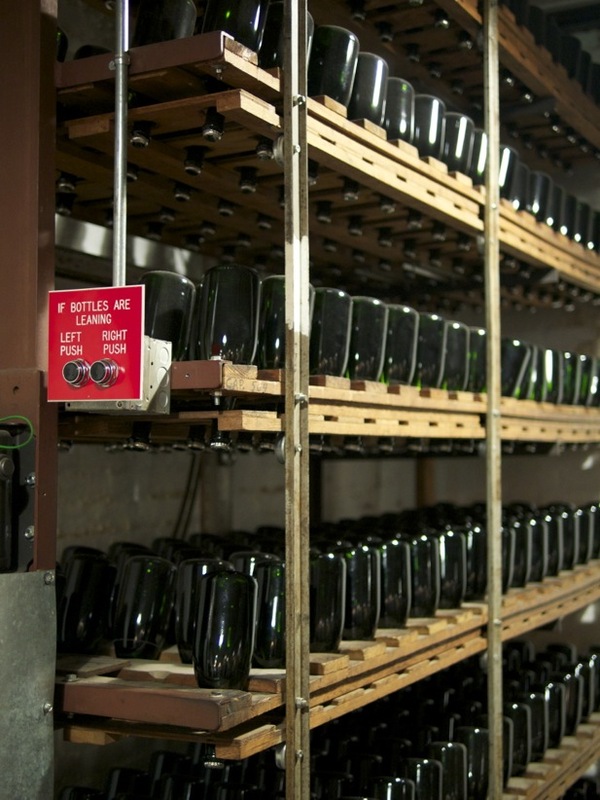 The day-to-night temperature fluctuations can sometimes swing 50F, which preserves the acidity in the grapes. They tend to pick on the early side, so their wines are very unlike any others in the Paso Robles AVA (which are usually very ripe). Very little, if any, SO2 is used in the production of their wines. While they aren’t cheap, their wines are built for the long-haul. 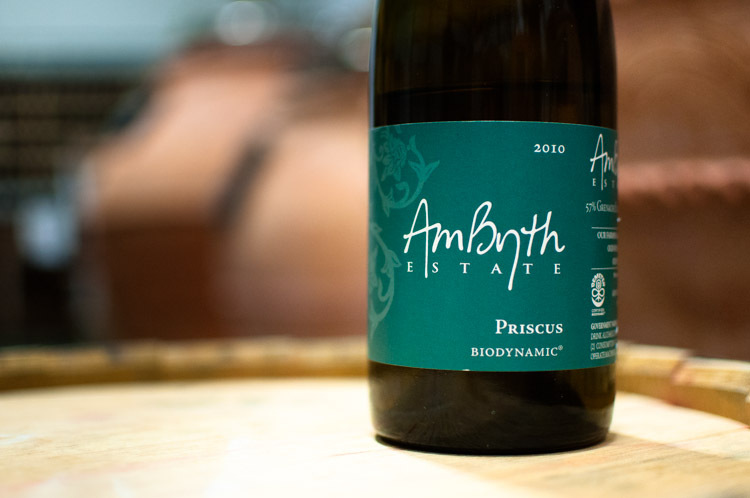 They were recently picked up by a well-respected wine distributor, so you can expect to see more AmByth wines in local shops. We highly recommend the Priscus white blend and the Mourvedre. Style: Hank Beckmeyer follows the ‘do nothing’ farming methodology of Masanobu Fukuoka, and his wines scream terroir as a result. Hank works mostly with Rhone varietals, both from his own farm and purchased from other vineyards. I can remember the first time I tasted his Cedarville Mourvedre; that was a wine that changed and excited me. I never knew that a grape which usually produces a rich, powerful, and extracted wine could make a wine with such femininity and finesse. 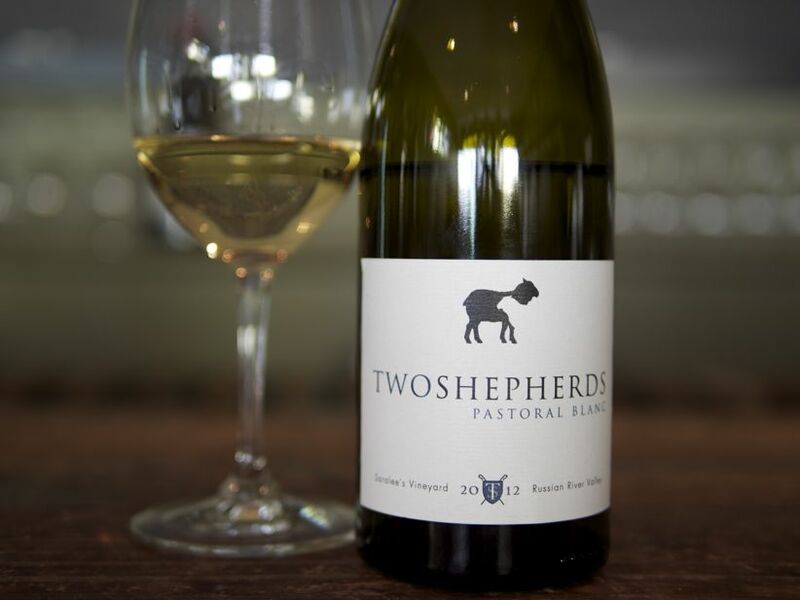 We also love his white wines, which have so much character they can taste totally different from day to day. La Clarine wines are the Everlasting Gobstopper of the wine world, and a crazy good value to boot. Style: Alex Davis has been quietly making some of the best wines in California for as long as I can remember. This is one of the first wine clubs I ever joined, and for good reason. They make my favorite California Pinot Noir, as well as a value-priced Carignan that is rustic, juicy and food-friendly. 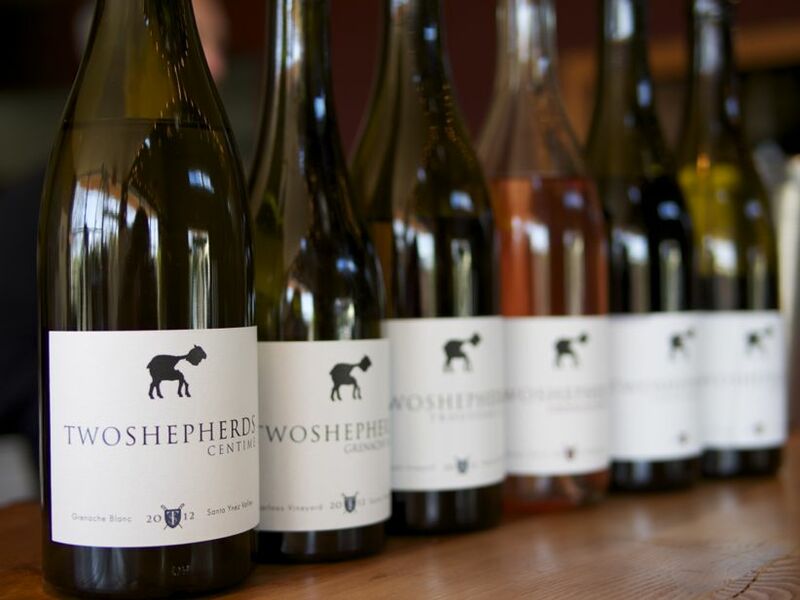 We love their Zinfandel, rosé, Chardonnay, Viognier… heck, we love everything they do. Alex spent a good amount of time in Côte-Rôtie, and naturally he also produces a slammin’ Syrah which is co-fermented with a little bit of Viognier, just like they do in the northern Rhone. 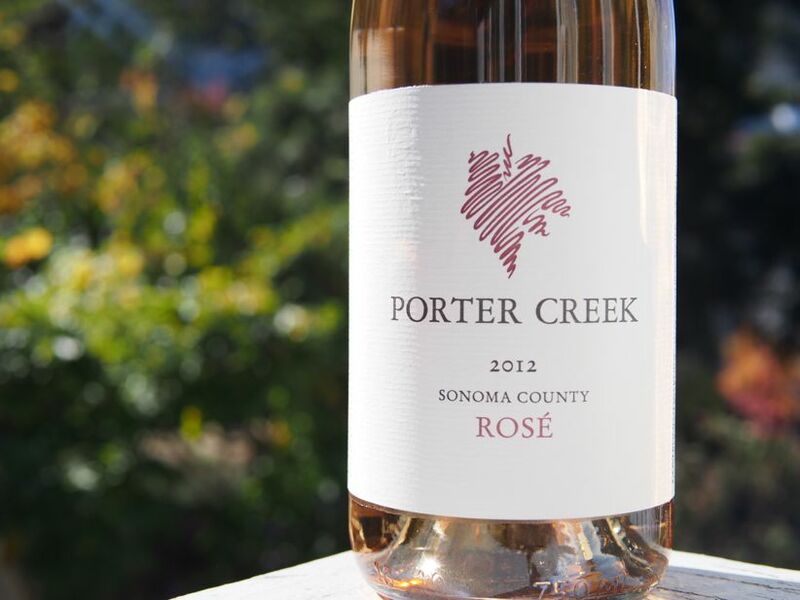 Porter Creek is very consistent, so it will continue to be an old standby for us. This is a recipe featured in our Fall wine club shipment. We chose to feature this recipe because it encompasses everything we love about fall food, and it perfectly compliments several of the wines we are offering in our Fall club shipment. Made with chanterelle mushrooms and delicious cave-aged gruyere cheese, this vegetarian dish is sure to delight your guests. It’s fancy enough for a holiday like Thanksgiving but easy enough to make for any day of the week. We really love it’s umami flavors and creamy/crusty consistency. You can find Chanterelle mushrooms at your local specialty store during the rainy months. Right now we are getting Oregon chanterelles as well as Pacific Golden chanterelles. I prefer the Oregon variety because they are cleaner, have great flavor, and a better texture (in my opinion). They are smaller and more orange in color than their California-grown counterparts. Chances are you will see only one variety, so get whatever you can. You want to pick out the chanterelles that look the best. Look for firm, dry chanterelles without any red rot or raggedy edges. Don’t skimp on the Gruyere, either. Get a good-quality cave aged gruyere from France, if possible. This should not be hard to find, as I believe even Trader Joes carries one. 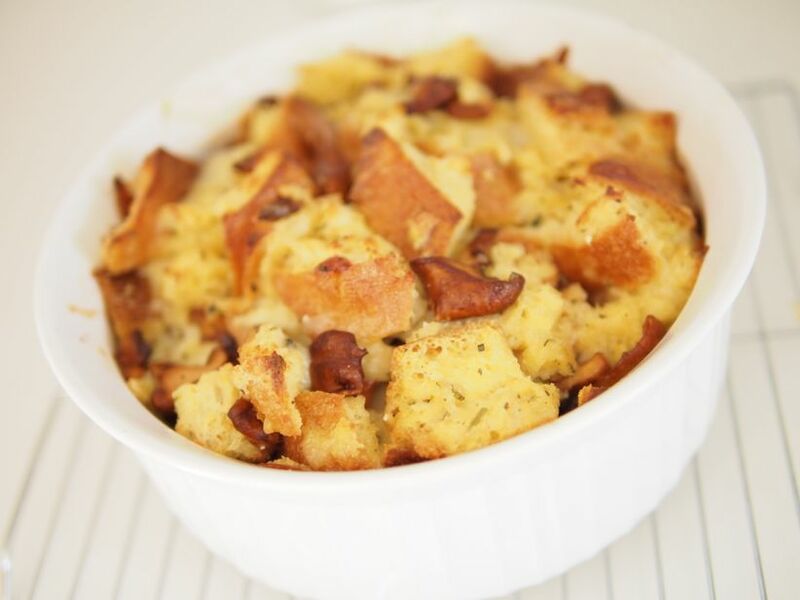 Butter the casserole dish or ramekins and set aside. Combine the milk, chopped herbs, and pepper in a medium pot with a heavy bottom. Set over medium-high heat until the milk just begins to simmer. Remove from heat and set aside to cool slightly. Meanwhile, melt the butter in a wide skillet over medium heat. Then add the mushrooms and salt and cook, stirring occasionally, until tender, about 5 minutes. (If substituting leeks, cook, stirring occasionally, until tender, about 10 minutes. Reduce heat if necessary to prevent browning.) Remove from heat and set aside. In a large bowl, whisk the eggs, then temper the eggs by whisking in ⅓ of the warm milk mixture. Once combined, slowly whisk in the rest. Add the bread cubes, shredded cheese, and mushroom or leek mixture and stir until well combined. Set aside for 15 minutes, stirring occasionally, to let the bread absorb the liquid. Meanwhile, preheat the oven to 375°F with a rack in the center. Spoon the mixture into the casserole dish or ramekins. Bake until the top is golden brown, 30 to 35 minutes. Serve hot.